Joni and Joe Carone pose with the Pink Drink sign that will appear at local McDonald's restaurants where proceeds of pink drinks will be donated to breast cancer treatment at Monongahela Valley. This fall order a "pink drink" from one of six local McDonald's Restaurants and the proceeds will go to the MVH/Lois Orange Ducoeur Breast Cancer Walk aiding the prevention, early detection and treatment of breast cancer at Monongahela Valley Hospital (MVH). 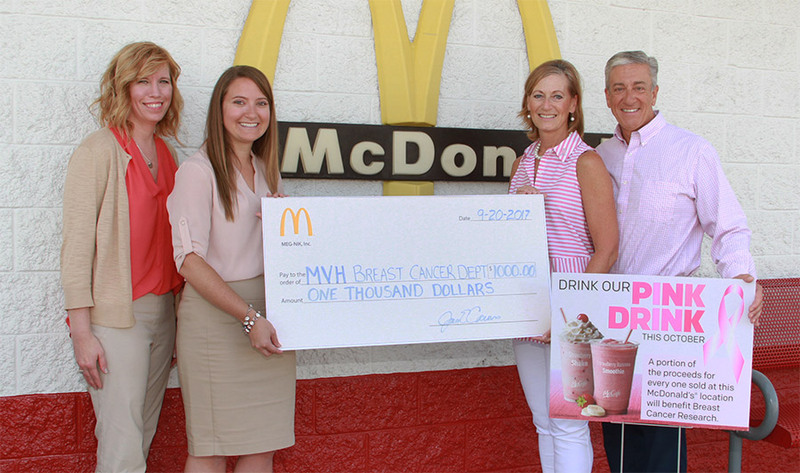 The "Drink Pink" campaign began last year when Joe and Joni Carone, owners of six McDonald's restaurants in the Mon Valley region, decided to take proceeds of "pink drinks" (strawberry milkshakes and strawberry-banana smoothies) from the McCafe menu and donate it to MVH. "Being a breast cancer survivor, I wanted to do all we can," said Mrs. Carone. She went on to say, "Our founder (Ray Kroc) said we have an obligation to give something back to the community that gives us so much"
"We have been involved with the Ducoeur Walk for several years, but wanted to do more," said Mr. Carone, "Last year we raised $1,000 with the drinks. This year we want to double it." 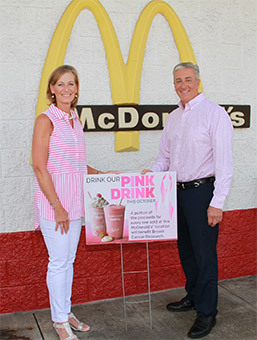 The "Drink Pink" campaign will begin Sunday, Oct. 1, and end Tuesday, Oct. 31, at the participating McDonald's restaurants in Bentleyville, Brownsville, Charleroi, Monongahela and the two in Belle Vernon. "When it comes to donating to breast cancer charities, you have to do your research as to where the money goes," said Mrs. Carone. "We know that the money donated to the Ducoeur Walk goes to the treatment of people in the Mon Valley." The MVH/Lois Orange Ducoeur Breast Cancer Walk is Saturday, Oct. 14, at The Market House in Charleroi. Registration for the walk begins at 9 a.m. and the walk starts at 10. For more information on the walk, visit the Web site. (l tor) MVH's Tricia Golden, oncology nurse navigator, and Melissa Marion, director of Fund Development, and Joni and Joe Carone, owners McDonald's Restaurants; pose with the $1,000 collected from the previous years' sales of pink drinks.